Last weekend, at a lovely wedding weekend for my wife’s cousin’s daughter and beau in the Leelanau peninsula area of west-central Michigan, some of us took a pre-wedding walk to Pyramid Point near Lake Michigan. The views up the short trail to the summit were spectacular. Descending to the trailhead, off to the side of the trail in a meadow area was a – very cool herbaceous flower. I felt like I should know it, but…There were unusual lilac to pink to whitish bracts atop the flowering stem. Wait, bracts? Think modified leaves, such as the colored “bracts” of poinsettia that are much more colorful than the flowers. Then to the flowers of this plant - they were unusual in shape, yellow with purple spots, sort of making me think of types of orchids or of snapdragon flowers. So, I phoned a friend, or more precisely sent an e-mail to my fellow BYGLers. Amy Stone promptly answered that it was horsemint, Monarda punctata. 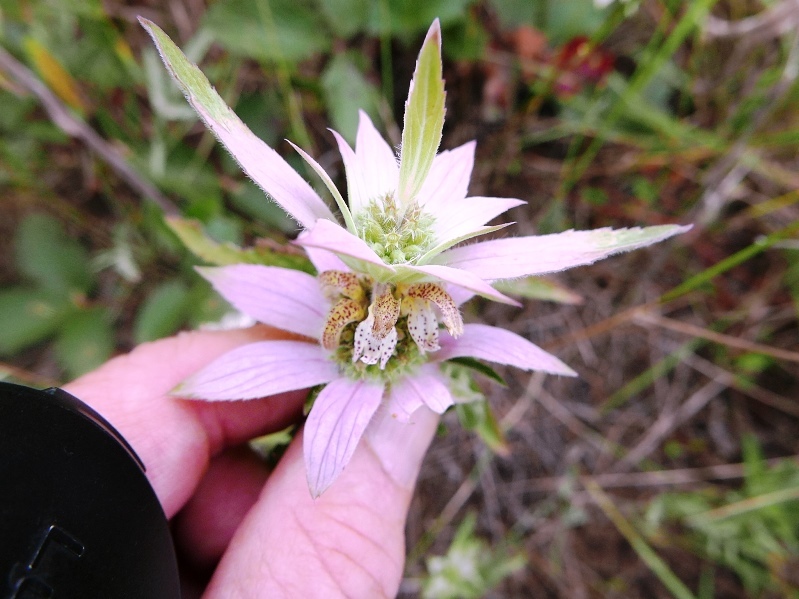 Other names include dotted beebalm, spotted horsemint, and so on. A mint! Oh, woe, the many cues I had missed. First of all, the aroma was a major clue: heavy with the smell of thyme, since horsemint has high levels of thymol. Second, square stems, common but not exclusively on members of the mint family, the Lamiaceae. Then, opposite leaves, and irregular flowers, with two upper petals and three lower petals. Stamens of four, with two taller than the others. All suggestive of the Lamiaceae. I missed it all. My excuse: wanting to get in my tuxedo (fake news!) in time. The genus Monarda was named for Nicolas Bautista Monardes, a Spanish botanist from the 16th century who, though he never made it to see our native beebalms, was given their name by Linnaeus in the 18th century. Did I say that Pyramid Point was beautiful?